Up until recently I'd been counting the days until my December mobile phone upgrade eligibility, the day I could extend my contract for another two years in exchange for a discounted iPhone 5. There'd been a gnawing anxiety deep in my gut, growing stronger each day my friends possessed Apple's latest gadget and I did not. Then I got my hands on the Samsung Galaxy Note II. I was introduced to the Galaxy Note II during a meeting earlier this year with the folks at T-Mobile. I sat down for the meeting and laid my iPhone 4 down on table. The T-Mobile rep laid the Galaxy Note II next to it. I was so taken aback by the difference that they took a picture of the two together and emailed it to me after the meeting. 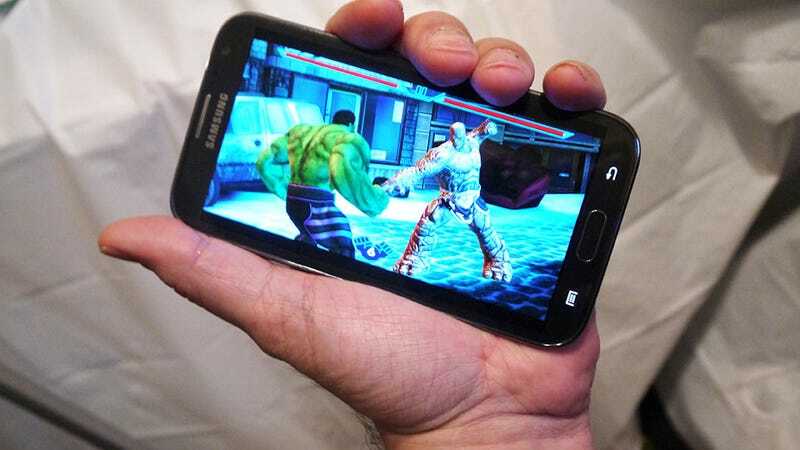 They used the Note II to show off games, figuring its 5.55-inch 720p Super AMOLED screen was perfect for such purpose. They were correct. I've been playing everything on my own Note II, from Need for Speed Most Wanted to Candy Crush Saga, and I am always impressed by the sharp colors and brightness of the screen. The comparatively tiny iPhone screen, in all its retina glory, just doesn't measure up. Powered by a 1.6 GHz quad-core processor, there's nothing on Google Play this baby can't play, short of Tegra 3 optimized titles (thank goodness for my Nexus 7). It's proven better for business applications as well. I figured the built-in stylus was a feature I would never use, but I find myself jotting down notes with it on a regular basis. Sometimes I use it to play puzzles games. There's even a nifty feature for capturing screenshots—hold down the stylus button, press it to the screen for a second, and instant screenshot. That's come in incredibly handy with my new position as Kotaku's mobile czar. Sure, the Galaxy Note II is huge, but so am I. At 6'6" with giant ham hands, I imagine me holding a Galaxy Note II, lovingly referred to as a phablet (a cross between phone and tablet), feels much like what it does when normal-sized people hold normal-sized phones. If you want to see how a normal-sized person reacts, ask Owen Good—after seeing the Note II in action during our trip to Kotaku's New York headquarters last week he bought one for himself. The Galaxy Note II has the power and convenience I need and it's Fahey-sized, but ultimately the credit or blame for my switching from iPhone to Android is on Apple's shoulders. With the release of the 5th generation iPod Touch, featuring all of the power of the iPhone 4S with the screen of the iPhone 5 and a ridiculously thin body, I don't need an iPhone anymore. If I want Apple gaming in my pocket, the iPod has it covered. The Samsung Galaxy Note II has everything else.